You would definitely want your prom night to be an event worth remembering. Along with a chic outfit, you would also want your arrival to be stylish for the special night. So, why not book a limo from Crown LV. We are one of the famous limo transportation companies in Las Vegas. We offer outstanding limo services in the city, ensuring that your special event is not only carried out safely but also magically. You can hire a traditional stretched limo if you are going to the prom in a tiny group of 8 people. But, if you are thinking to travel with a large group of friend consisting of 14 to 40 people, then you can book from the fleet of party buses that we offer. Each of them is accompanied by a professional chauffeur. Hence, rest assured that you will have a safe and hassle-free ride around the town. The party buses that we offer are pretty spacious and big. These generally include a big LED screen where you can watch a movie with your friends and get a theatre like experience. These also include a dance floor with music systems where you can sing and dance to your favourites. To add to this, disco lights are also included to create a part like atmosphere on wheels. Each of the buses has a restroom, making your ride more comfortable. Amenities like air-conditioners, plush leather seating, Wi-Fi, and many others are included both in cars and buses to make your travel luxurious. 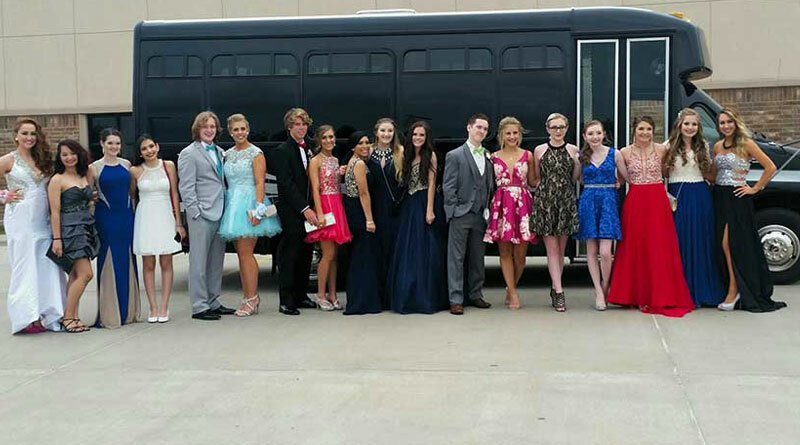 With Crown LV, you can hire a party bus for prom night at affordable prices. Our vehicles will also be dressed up, making your arrival at the prom absolutely lavish and stunning. Your comfort and security for the prom will be our responsibility. Booking can be made online via website and over call both.